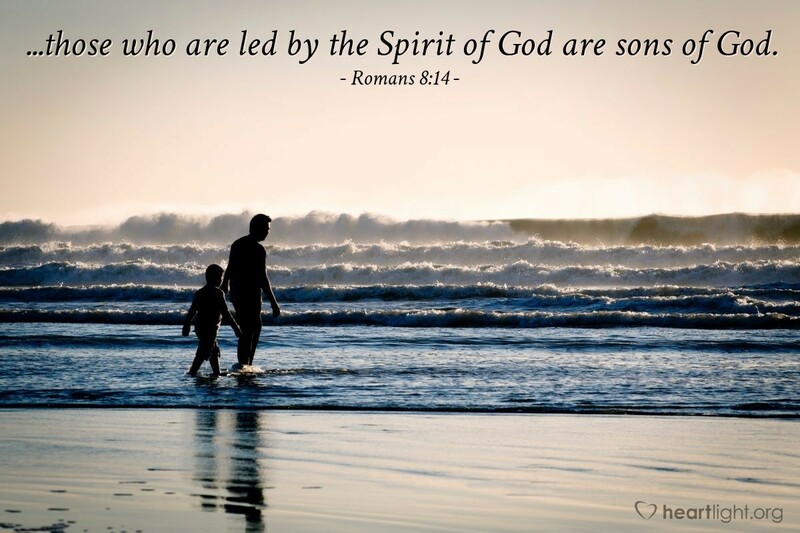 ...those who are led by the Spirit of God are sons of God. The Holy Spirit is God's seal on us. The Spirit lives in us and his presence in us means we are God's temple. The Spirit works to transform us to be more like Christ. The Spirit helps us produce the virtues of Christ — love, joy, peace, patience, kindness, goodness, gentleness, self-control, and faithfulness. The Spirit intercedes for us when we pray, communicates the groanings of our heart when we don't have words, and fills us with power when we worship. In addition, the Spirit is our assurance that we are God's children. We are his. His future, his blessings, and his grace are ours. Dear Father, thank you so much for living inside me through your Holy Spirit. Thank you for the assurance of your love, your presence, your power, and your guidance as I try to make the decisions and face the challenges of my daily life. Dear Father, as I yield my heart and my will to your Spirit's transforming grace and power, please help me develop more of your character and more completely display your grace today as I face the tasks before me. In Jesus' name I pray. Amen.